My wife and I will shortly take ownership of an 8 month old male Bengal from the RSPCA. The cat was rescued from a breeder and is playful and inquisitive but timid and unsure around humans. Social skills are missing and he doesn't like to be touched therefore my question is, what is the best way to reverse this problem so he becomes used to the human touch? Any advice or guidance would be most appreciated - thanks. We have four Bengals, all brothers. One has a problem with his eye so his vision isn't 100% on one side, as a result, he's quite cautious and used to be very very timid. Since February we have been taking all four out every weekend, to pet shops/wooded pond areas etc and Vega is now much much better. He is still cautious when someone new comes to the house, but it doesn't take long for his curiosity to kick in. My advice would be the following. Of course keep in mind that his whole world will change as soon as you get him home. So, that said, Imo. 7) Remember that how you interact with him from day 1 will have a huge impact on how his attitude will develop and be carried into adulthood. Congratulations on your soon to be new addition, poor thing having to be rescued from a breeder. He's still young so hopefully he will still be adaptable which is in your favour. Excellent advice from Xplosiv. The only thing I would add, is for the first few days, keep him in one room for him to reacclimatise (ie a 'safe room'), that way he won't be overwhelmed with too much new space all at once. If it was me, I would go and sit on the floor in the room and just talk to him but not try to approach him, hopefully he will learn to trust you and want to get to know you after a while. Just get him used to your scent, voice etc and by being on the floor you won't seem too intimidating. When he starts to be curious about the other side of the door, gradually let him explore the house. He'll let you know when he's ready to do that. Thanks Clare, that's one thing I missed, the movement of food / water / litter. Try to avoid moving these as much as possible, a safe room works well in some cases, but mostly in cases where that room will always be a cat welcome room. Don't move these facilities from that room without another source elsewhere, or you'll most likely have 'accidents' occur, due to the initial habbit/routine established from day 1. Expanding their territory is always good, just use common sense while doing so. Adding my little bit to the excellent advice above. If he is timid definitely let him come to you. Just sit with him in his safe room and talk to him - a lot. We have a seven yr old male rescue and when he first arrived he hid and my daughters went in and read him stories so he would get used to their voices and presence! Oscar did not really like to be touched and he is now the cuddliest snuggle bug around! Have lots of places the cat can retreat to ie cat trees and cave beds are great. Very tall scratch posts are great too. I would sit with him armed with treats to tempt him with and a wand toy to gently swish to see if you can get his playing skills going! When he is settled and has the whole house then make sure he has a cat tree and beds in your main living area to get him to want to be with you. I also would sit next to Oscar while he ate and gently touch him all over and pick his paws up. I could tell it irritated him as he just wanted to demolish his food in peace but it helped him accept touch from all of us. With litter issues - I learnt the hard way and I now have three litter trays two downstairs and one upstairs with no accidents for last ten months! I would get the biggest litter trays you can. I have huge covered maxi bella ones as bengals can be big and long. Good luck and how lovely to hear of another bengal being rescued by the right people. Have patience as it sounds like your boy will have to learn all his social skills again. Bless you for rescuing this little baby! You've gotten great advice so far! The key is not to overwhelm him. Going to a new home is stressful enough. He is going to need his space, but you're also going to have to get him used to you. So, give him a couple of days to adjust. Feeding treats is a good way to start the bond. And definitely soft talking to him while he's eating -- sometimes you can even pet him while he's eating. Getting down to his level on the floor, so you're not towering over him. And playtime .... engage him with toys. Just know that this will take some time, but you should see improvement as you go. He is still a young kitty and his socialization skills should improve over time. Congratulations!!! I don't think you should equate touch with his ability to bond with you. They are not the same thing. To me, play is definitely the currency that bengals understand best. When you become his favorite playmate, and he sees you as his provider, you will be well on the road to establishing a great relationship with him. 1. Give him "jackpot" treats from your hand. Cooked chicken and turkey or other deli meat. 2. When he is distracted eating, see if you can touch him VERY gently, right along the head region between the ears. 3. Try combs or brushes. I found that a flea comb often works really well, as do those cat grooming mittens. Never force it though. Make the attempt, and if he rejects it, he's not ready, so be it. Try again later. You've got a lot of years with him ahead of you, so don't rush it. He definitely needs his own safe space/room with lots of hiding places. Work at his pace. Don't force him in to any situation he's not comfortable with. If he's hiding, go sit in the room and read a book out loud, so that he gets used to your voice. Or sit with your laptop/phone/tablet and just talk to him. Spend time in there just being with him, no touching, no interacting. Cats are curious, he'll come to see what you're doing when he's brave enough. Don't stand over him, spend time on the floor so you're at the same height as him. Toys and treats are great - when he's ready. Interact using them. If he's already playful then this is a good thing. He'll let you know if and when he's ready to be touched. Go slowly. It's not a necessary part of bonding at this point, it will come. Good luck. Rescues can be a lot of work but the rewards are huge. Wow - this is fantastic on 2 accounts. Firstly, thank you so much for your replies and advice and secondly it was reassuring to know that most of what you had advised was what we had already thought of doing. There were some very good tips that we were not aware of though so we will adopt those as well. With regards to diet, at the moment Ben is fed on dry food at the RSPCA centre, what food should he be eating in the long run, should Ben be eating fresh meat regularly, how often should he be fed - he is on one feed a day at present - surely that isn't enough? The safe room we have in mind is a small room upstairs that has no hidey places. We intend to put a litter tray, food a cardboard box and some toys there at first then introduce a tall scratching post. After a few days we will open the door that gives access to the landing and stairs - all other doors will be kept closed to see how he gets on. I am much more a dog man but this new adventure has really gripped me - I can't wait to bring Ben home and give him a new start in life - I really hope he bonds and becomes a snugly, adventurous and playful cat. All kitties enjoy hiding away at times. Invest in a good, sturdy cat tree for Ben. As for diet .... continuing with the same food for a while will probably be the best thing. As we've all stated, a new environment is stressful and can upset a kitty's tummy as it is. Change the diet and it can be even worse. An adult kitty should eat at least twice a day. My bengal is a "grazer" and he eats throughout the day. Personally, if you can give Ben three meals a deal, that would be ideal, but a lot of people work, so they feed in the morning, when they get home and a small meal before bedtime. Your bengal will thrive on any high-quality dry or wet food. 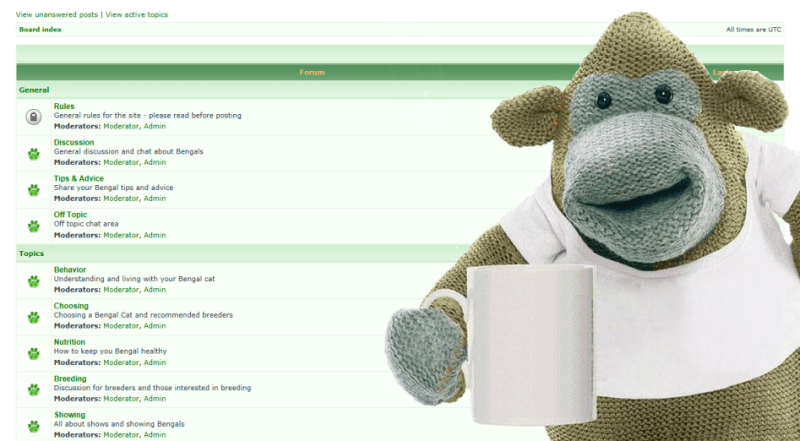 There is a topic on raw feeding in the Nutrition section of the forum. Transitioning a cat to raw will take some time. For the moment, you need to "upset the mix" as little as possible. You will have many, many years with Ben, so these first few weeks aren't the biggest deal. Let him investigate things at his own pace. He will bond with you, want to be with you all the time, and will be social! Hopefully, you will keep him indoors, but bengals love to walk on a harness and leash and get some fresh air. You might want to place a blanket in the box so Ben can use it as a bed! He's got to sleep somewhere. LOL. I think you're planning to do all the right things -- take things slow. Everything will pay off in the end. Do keep us informed! We love hearing success stories. It sounds like you are in the UK as he's an RSPCA rescue! I feed Oscar two tins of Canagan (applaws very good too) wet food, morning and tea time. He then has some grain free biscuits to nibble on during the day and overnight. Canagan is not cheap but as someone on this forum said - if you feed them top quality then the vets bill should be lower as their health will be better overall and teeth better as not having rubbishy cat foods full of fillers etc. Also I would like to put in a request in advance for Ben - get him a Willows Monstrous Snuggle Bed from Pets at Home. I cannot tell you how much he will love it. Oscar just adores his and Claire (Tabitha) got one for Hendrix and Jagger, she then got another one as there were arguments over it. It feels like as soft as a mink coat and will make Ben a VERY happy cat! £35 but worth every penny! It's funny because Raiden has several beds, but he prefers sleeping in our bed (he's napping there right now). I have his heated beds out (unplugged) and he sometimes will nap on one, but he also prefers the couch! Oscar's bed looks so comfy that I think I'll get one for me, if you think I could fit inside! Sherry, I think they only do cat size If they did human size I would have died and gone to heaven I would never leave the snuggle bed and would get nothing done! Heaven! All of my pets are rescues, often from bad environments, and my main piece of advice to you is that cats can take years to overcome what has happened to them in the past. In Thomas' case, he was very sick when I got him, so we were able to bond more quickly due to my having to nurse him for six months straight. He then became very clingy and anxious. When it became clear he was ready for a friend about three years in, his personality had another major change. He is now the confident alpha cat who has taken the little one under his wing. So, congratulations on having rescued a cat, and just try to remember that this is a very long process! And here are my two both crammed into one snuggle bed! Don't wash it, Melissa advises me it doesn't wash well! But hoovering it has it as good as new. Pets At Home do some excellent dog beds as well, loose crumb memory foam which have removable covers, I have a couple of those as well for my two. I discovered the hard way about washing beds, the insides lump up never to be the same and end up in the bin. Re food, mine are fed twice a day, with dry to snack on. They eat Meowing Heads (wet and dry) and I also feed them Thrive wet. I try to keep a couple of different types in that they like in case they have a picky moment. They have 1.5 cans each per day. But keep Ben on what he is eating now until he has settled in and then gradually introduce different foods and see what he likes. I tend to try to keep mine on high protein, no grain foods to avoid fillers and such like, and avoid anything that says animal derivatives. There is plenty of information on the forum about raw feeding if you are interested in trying that and keeping him on a very natural diet.